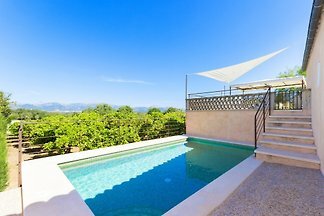 This modern villa is situated in Jornets, in the centre of Mallorca and can comfortably accommodate 8 guests. Welcome to this villa located on the outskirts of Sencelles, with private pool and capacity for 4 people. Welcome to this beautiful finca with two buildings, located in the rural surroundings of Inca. It has magnificent views of the countryside and has capacity for 8 people. This magnificent villa features and a fantastic private pool and garden, is located at Inca outskirts, at the heart of the island and can comfortably accommodate 6 guests. Beautiful and charming cottage on the outskirts of Sencelles, in the centre of Mallorca, with private pool and space for 4 people. Rustical country house with private pool in Sencelles, for 12 persons. from 5 1 holiday homes & accommodations in Jornets were rated with an average of 5 out of 5 stars ! Rent successfully your holiday flat or holiday home in Jornets in only 20 minutes !